As a non-profit service organization, educational institution or government agency in Central Florida, you may be looking for programs and resources for your clients. Or perhaps you provide services, resources or training, and need to find motivated clients in which to serve. What if there was a solution, a Partner, who could provide your clients with the opportunity of a lifetime, while at the same time providing you with clients who need your services? 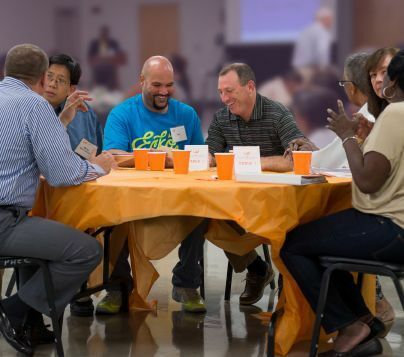 We invite you to connect with us and experience the power of Partnership in reaching your organization’s goals while we effectively transform families and entire communities, together. The Jobs Partnership has developed a unique and proven solution to poverty built on the Biblical truth that all people are created and designed by God to work, to be fruitful and to have purpose in their lives. Together with our Church Partners, we provide an innovative training course for economically trapped men and women called LifeWorks. LifeWorks isn’t a job skills class–it’s more like a boot-camp for life and work, with faith-based yet practical teaching that transforms the head and heart. This no-cost training course is the beginning of a series of life-changing opportunities for Participants. We recruit potential Participants through our Community Partners, Churches, Volunteers and other community-centric avenues using our LifeWorks marketing materials. Participants apply via our website and if qualified, attend a mandatory orientation in order to become a Participant. The 12-week course meets for one evening per week, twice per year at regional training sites around Central Florida. During the course, participants are paired with a volunteer Coach, attend an exclusive Resource Fair with our Community Partners, participate in a private Career Fair with our Employer and Educational Partners, have access to our Job Connection online portal, and much more. Before Graduation, participants are guided in choosing the right next step through our Career Pathways process, which opens up a world of opportunities. The goal is to equip them, empower them, and launch them into a career-path opportunity that will lead to a family-sustaining wage as they continue the way forward….The Way Up. If your clients are stuck in life and work, lack a helpful network of relationships, have negative attitudes and beliefs, and sincerely desire change, LifeWorks could be the answer you’re looking for. We offer one-on-one, intensive help to Participants during our LifeWorks Training course with the goal of setting them on a new path to career and life success. Contact us to learn more and to request LifeWorks recruitment materials. Fulfill your organization’s goals in transforming the community by providing your valuable resources, vocational training and other services to participants and Graduates. As a Community Partner, you’ll have access to our Participants through our Resource Fair that’s held twice per year. At this exclusive event, you’ll have a display table where representatives can personally interface with our Participants and talk about the critical services that can help them in both their personal lives and work situations. You’ll also be featured in our website’s list of Community Partners that’s promoted to all of our Participants and Graduates, past and present. TO EXPLORE AND DISCUSS PARTNERSHIP OPPORTUNITIES, PLEASE FILL OUT OUR FORM, OR CONTACT MARC STANAKIS, PRESIDENT AT 407-641-0755 X104. Below are the tools for recruiting economically trapped men and women who are ready for change to attend our LifeWorks course. Printed versions of these materials may be ordered through The Jobs Partnership.